Hi I'm Jane and welcome to my website. I completed my instructor training with LDC, and am fully trained in using the LD system. 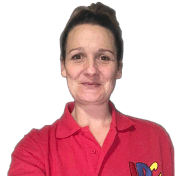 I chose to work with LDC because everybody is different and the LD System allows for flexibility in lessons so that you learn to drive safely at a rate which suits you. If you are looking for lessons in Worcester, Martley, Droitwich or surrounding areas please feel free to get in touch. I live in Worcester and have 3 children aged 14, 11 and 2. Having 3 children at quite different ages has taught me to be a very patient person. Before becoming a driving instructor I worked on a horse racing yard. It was a job I really enjoyed. This work involved understanding the different personalities of the race horses I worked with. I mention this as it is not too far removed from the skills used in recognising my pupils needs and adapting their lessons accordingly. In fact, It was while working with race horses that I first trained people to drive by letting my colleagues who wanted to learn, drive around the fields when checking on the horses. Don't worry, we were properly insured to do this and we were on private land, as required. This was when I realised how much I enjoyed teaching people to drive and the feedback received from my colleagues convinced me to change career and become a driving instructor.